I was recently asked to create a hockey baby nursery theme. Sports fans love to decorate their baby’s rooms with memorabilia and motifs that reflect the passion they have for their favorite games. Hockey fans are nothing if not passionate, so I knew that I would need to do a little research into which the all stars of this sport might be as well as what equipment I could use as room decorations. This sports oriented Dad, the hockey nut, was one of the most involved pops that I’ve ever encountered in my nursery decorating days. While I was in charge of the basic layout of the nursery design, he actually contributed some really cool ideas for hockey wall art, bedding and accessories. Go here to see more budget friendly items that can be used to decorate the walls of a hockey theme nursery room for a baby boy or girl. The decorating budget had room for a complete makeover, but to save money for another area of the sports decor we used the existing wall color for the lower third of the wall. Hockey themed adhesive wall border was used at chair rail height and the top two thirds of the hockey baby nursery wall were given a fresh coat of paint in a lovely contrasting shade taken from the wallpaper border. Here’s an idea for a creative hockey border for your walls: Stencil a pattern of crossed hockey sticks around the room at ceiling, floor or chair rail height. 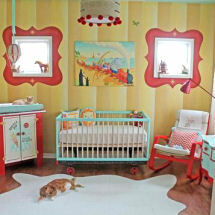 You can use the same pattern to personalize your baby’s furniture. A motif on the crib’s headboard or the center of a dresser drawer would be really cute. At the time of this decorating article the best way to get some coordinating bedding for your hockey baby nursery theme would be to make your own crib set. Pick out some fabric with hockey sticks, pucks or your team’s logo and make your own duvet, crib skirt and bumper. Add a solid color crib sheet and you’re in business. When picking out bedding fabric, buy extra yards to use as drapery panels. Rod pocket draperies are an easy sewing project and if you are not comfortable with full length curtains, sew a valance and add matching window shades. For your drapery hardware,buy a used hockey stick, sew the pocket of your window treatments to fit and there you have custom hockey theme hardware for your baby’s nursery. Don’t throw out your existing table lamp or floor lamp until you are sure that it can’t be updated to work with your hockey baby nursery décor. Stickers, patches or stencils on the lamp or mini chandelier shades will make it seem as though the light fixture was made for your bedroom. Your baby will love them during the toddler stage and they will provide extra seating for when the family gathers to enjoy your all star hockey baby nursery. Return to Unique Baby Gear Ideas to see more sports themed decorating ideas.